Like every red-blooded American boy of a certain age–gay or straight–the first time I saw Judy Garland I fell deeply and tragically in love. Those big cocker spaniel eyes; the quivering lip when faced with perplexity; the slightly pudgy midsection; the permanent wave that anticipated Farrah Fawcett’s flaring side-bangs of the seventies. She was, as the French would say, trop pour moi. Also des saucisses, sans doubte. But what I and my somewhat effeminate friend Dennis loved about her most was her willingness to stop whatever she was doing, no matter how important, and break into song. Some of the transitions were awkward, of the “. . . and that’s why I say–” variety memorably mocked by comedian Jonathan Winters in his stand-up send-up of Broadway shows. But we didn’t care. No, Judy was our heroine, and not just because of The Wizard of Oz, one of those classic movies an indulgent teacher might actually let you watch in the classroom as a study aid to Frank Baum’s text. Judy–like Dennis and I–had a dream burning inside her, an eternal internal flame, and she wasn’t going to let anybody or anything stand in her way. In Dennis’s case, that dream was his own backyard puppet show. He didn’t care what the rough boys said about him; he just went ahead and built his jerry-rigged puppet theatre, set it up in his front yard, tried to charge admission–a dismal failure, since you could stand outside his fence and watch for free–and then put on his show. Er, you may want to re-think the minstrel number. In that 1939 movie, Mickey and Judy put on a show because their parents, aging vaudevillians, won’t take them on a revival tour, sort of like Ozzie Osborne not wanting to let his kids perform in a Black Sabbath reunion concert. The “Let’s put on a show” theme has morphed into something larger with a much broader reach; it is now used as an inspiration when times seem bleakest, a ray of hope in your darkest hour in a wide variety of situations. Outbreak of bubonic plague? Mudslide in the Chilean Andes? Forty-car pileup on fog-shrouded highway? Let’s put on a show! The number of Let’s-Put-on-a-Show movies is in the low double figures, including such cinema classics as Blues Brothers, The Full Monty, White Christmas and Hannah Montana. South Park and SpongeBob Square Pants have used the theme, as has The Onion. It’s not too great of a stretch to say that one-off benefits such as Farm Aid are real-life derivatives of the phenomenon, a sort of life-imitates-art inversion. The importance in life of merely putting on a show was impressed upon me in college when, trying to make time with the most popular woman on campus, I uttered some cutting remark about a half-assed band playing covers of Grateful Dead songs at a backyard party. “Well, at least they’re doing something to make life more enjoyable around here,” she said with disdain bordering on contempt. Also bordering on Lake Michigan, since we were in Chicago. I took that lesson to heart, and as a result have since put on plays of my own composition in venues large and small, but mainly small. The basement of a former grade school. A room in a YMCA next to the indoor swimming pool, which steeped the audience with the smell of chlorine. I reached the nadir of my experience as playwright one night in Salem, Massachusetts–that’s right, where they used to burn witches. I had responded to a “call for scripts” and my hockey-themed play was selected for a reading! When I arrived at the address the night of the performance I found–a pizza parlor. Thinking there was some mistake, I took a walk up and down the block. No performance space to be seen. And so, after the last slice of pepperoni and mushroom had been served, the world premier of What Mickey Belle Isle Told You was held before an audience of precisely one (1); the janitor, who was sweeping up. 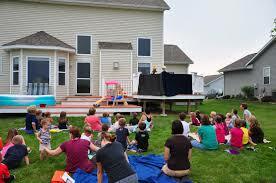 But these are the indignities that backyard impresarios and community theatre playwrights endure for your sake, to make of the world a brighter place, one where children laugh, and hearts are free, where men put on shows and women love ‘em. Instead of the guys in that Godawful Grateful Dead cover band. feed ` Jonathan W. ?